Slam the top of the Bean Pod and be amazed as the Bean Pod expands and bursts open! Inside you will find 8 Mighty Beanz and one Collector's Guide! There are 120 Mighty Beans to collect in Series 1. 5 out of 5 stars - Mighty Beanz Golden Slam Pack -Includes 1 Golden Bean! 2 product ratings2 product ratings - Mighty Beanz Golden Slam Pack -Includes 1 Golden Bean! Set of Mighty Beanz Star Wars in Darth Vader case. 21 individual characters plus carrying case! Total of 16 Mighty Beanz with at least 2 being Gold Edition. 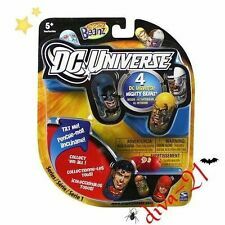 Marvel Mighty Beanz Series 1 - 4 Pack. Condition is New. Shipped with USPS First Class Package. LOT OF 50 DIFFERENT MIGHTY BEANZ! ALL ENCASED IN SERIES 2 BOX! EUC, EXCELLENT! 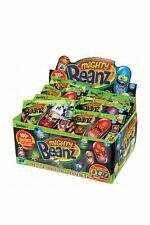 LOT OF 50 DIFFERENT MIGHTY BEANZ , ALL ENCASED IN SERIES 2 BOX. ALL IN VERY GOOD CONDITION.. Feel free to ask any questions and thank you for looking. New ListingLot of 20 TMNT Teenage Mutant Ninja Turtles Mighty Beanz - Leo, Raph, Mike Etc. LOT OF 57 - MOSTLY SUPERHERO - MIGHTY BEANZ - WITH RED SNAP CLOSE CASE - RARE!! Teenage Mutant Ninja Turtles Mighty Beanz Lot, Shredder 21, Foot #1 14 & More! Teenage Mutant Ninja Turtles Mighty Beanz Lot, Mike Fighting Gear 32 & More! Teenage Mutant Ninja Turtles Mighty Beanz Lot, Don Fighting Gear 30 & More! Teenage Mutant Ninja Turtles Mighty Beanz Lot, Yoshi 23, Guardian 17 & More! Marvel Mighty Beanz Lot, Red Phoenix 57, Cyclops Skrull (Zombie) 42 & More! Marvel Mighty Beanz Lot, Black Panther 48, Wolverine 44, Human Torch 18 & More! Star Wars Mighty Beanz Lot, Darth Vader 4, Jabba The Hutt 9, Wicket 28 & More! Mighty Beanz Lot, Transforming Bean 315, Mad Cow Bean 137, Nerd Bean 63 & More! Marvel Mighty Beanz Lot, Beast 32, Punisher 11, Captain America 3 & More! Marvel Mighty Beanz Series 1 4 Pack Target Exclusive Unopened Fin Fang Foom NEW! The item for sale is a brand New in package Marvel Mighty Beanz Series 1 4 Pack Target Exclusive Unopened Fin Fang Foom is showing NEW!. Condition is New. Shipped with USPS First Class Package (2 to 3 business days). Marvel Mighty Beanz Lot, Hawkeye 34, Yellow Daredevil 30, Bullseye 21 & More! Star Wars Mighty Beanz Lot, Padme Amidala 31, Jawa 29, Boba Fett 19 & More! Lot of 30 Different Mighty Beans with Red Carry Case EUC!!!! Mighty Beanz is a collectible toy that was popular in the early 2000s and continues to be sold to the public. These tiny, pill-shaped toys feature wacky and colourful designs, and the toys contain small weights that allow them to race down various tracks. Each Mighty Bean has a different character painted on, and the Mighty Beanz have various editions and groups that each persona belongs to in the collection. How can Mighty Beanz be used and enjoyed? There are three major reasons Mighty Beanz can be fun, enjoyable toys for both children and adults. Nostalgic, entertaining toys: The original set of Mighty Beanz went on the market in 2002. The Beanz can offer plenty of fun because they roll around in a way that is unique from other toys. They also include heroes relevant to children and young adults alike with people from Star Wars and the DC Universe featured on some Beanz. 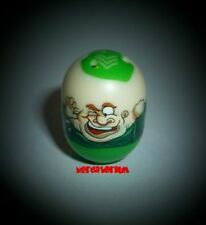 Competitive: One of the main ways to play with Mighty Beanz is to race them down certain tracks. The Jump Track, Flip Track, Collision Chaos, and Super S-Bend are four racing courses for the Beanz to compete on when they're in use. Collectible: Each Mighty Bean is a unique personality, and each pack of Mighty Beanz had the chance to unlock a rare or extra-rare Mighty Bean. 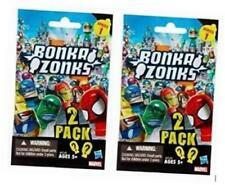 The early packs then expanded to include ultra-rare Mega Beanz, another type or version of each Bean. The racetracks also included secret special Bean editions. 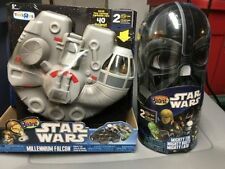 Some sets, like the Star Wars set, have the potential to become collector's items. What editions of Mighty Beanz are there? Since the toy's humble beginnings, Mighty Beanz has expanded into multiple normal series and editions. Partners such as The Simpsons and Star Wars have gotten their own specialty sets of Mighty Beanz, letting the users spend some quality time playing with Bean versions of their favourite people from these universes. Mighty Beanz Series 1-5: These were the original Mighty Beanz sets introduced between 2002 and 2006 and included highly coveted items such as the red collector's box, the glow-in-the-dark Bean, and the famous Flip Track. 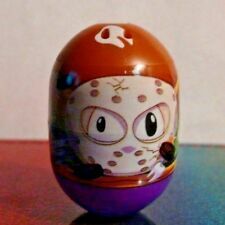 Many of the original Series 1 toys are considered collectibles, especially the aforementioned Flip Track and Mega Bean versions of some Beanz. Star Wars Mighty Beanz: During the time of the 2010 relaunch the toy company partnered with other franchises, including Star Wars. An entire set of Mighty Beanz Star Wars toys was produced. Some of the notable Mighty Beanz Star Wars models include Darth Vader, Luke Skywalker, and Yoda. Other Star Wars champions are also available, and some of the rarer Star Wars characters are beloved heroes from the new movies. 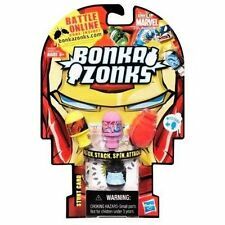 Marvel Universe: Another partnership resulted in Marvel Universe Beanz. This series included famous superheroes like Spider-Man and the Fantastic Four represented as Beans. Content provided for informational purposes only. eBay is not affiliated with or endorsed by Mighty Beanz.